Looking for a uniquely wonderful vacation that offers miles of an almost deserted beach, the ultimate in fishing, and lots of privacy, quiet times, and a glimpse of yesterday's Florida? Gasparilla Villa offers this and more. You have found a true island paradise for beach goers and fisherman alike. Your family and friends will never forget this wonderful experience. Gasparilla Villa is tucked into mangroves and palms on the bay side of a quiet bridgeless barrier island on the Gulf of Mexico next to Boca Grande. The Boca Grande area is world famous for its quality fishing and hosts one of the finest backwater flats in Florida. With a choice of bay fishing, surf and deep sea fishing, almost anything goes. Try your fishing skills on tarpon, snook, redfish, mullet, mackerel, red snapper and grouper. Gasparilla Villa has its own private dock, a newly expanded deck and covered fish cleaning table and lots of freezer space. Leave your fishing gear on the boat. For the beach comber, there are miles and miles of almost deserted pristine beach with no condos, stores or gift shops. Abundant shells await with swimming and shore birds only a three minute walk away. At sunset, it is an island tradition to always be on the beach with your favorite beverage to watch the dramatic show and try to spot the elusive green flash. Snorkel, kayak, canoe or sail in the waters that surround the island. Rent a golf cart and explore the miles of nature trails and roads. There is even a local captain that will give you and your guests a scenic tour. There are several excellent restaurants available by water taxi or your own boat for some of the finest seafood on the Gulf Coast. Numerous golf courses surround the area on the mainland. Upon your arrival you will be greeted by your personal island mate who will acquaint you with the Villa and the Island. Your island mate will be available all week to meet your needs. A water taxi is available for transportation is you do not own a boat. House Description: Two story with upstairs main living space. Two bedrooms upstairs (one king one with twin beds), living/dining room with kitchen. Two bathrooms upstairs. Downstairs is a large screened room with sitting/play area, large table that seats 8, large frig/freezer, washer/dryer, bathroom with shower. Immediately adjacent to the house is a one room cottage with fold out couch, TV/VCR/DVD, small refrig, microwave, coffee maker. Canoe, kayaks, paddle boards on property for your use. Amenities: Central Air and Heat, ceiling fans, screened porch, 3 minute walk to beach, deck and deck furniture, beach chairs, beach towels, lines provided, separate air conditioned one room cottage, private dock, dishes/utensils provided, separate fish cleaning house, screened in room with porch furniture, large table and play area. Blender, coffee maker, propane grill and BBQ utensils, stove with oven, hair dryer, toaster, 2 full refrigerators with freezers, two microwaves, dishwasher, washer, dryer, propane smoker, garbage disposal. Alarm clocks, three TV's, two VCR's, two DVD players, radio/CD/Tape player, canoe, DVD movies, games and puzzles. There are 4 Kayaks available with seat, paddles and kayak life vests. House Description: Two story with upstairs main living space. Two bedrooms upstairs (one king one with twin beds), living/dining room with kitchen. Two bathrooms upstairs. Downstairs is a large screened room with sitting/play area, large table that seats 8, large frig/freezer, washer/dryer, bathroom with shower. Immediately adjacent to the house is a one room cottage with fold out couch, TV/DVD, small refrig, microwave, coffee maker. Small john boat and canoe on property for your use. If more than 6 individuals, there will be an additional charge of $100/person. Amenities: Central Air and Heat, ceiling fans, screened porch, 3 minute walk to beach, deck and deck furniture, beach chairs, beach towels, lines provided, separate air conditioned one room cottage, private dock, dishes/utensils provided, separate fish cleaning house, screened in room with porch furniture, large table and play area. Blender, coffee maker, propane grill and BBQ utensils, stove with oven, hair dryer, toaster, 2 full refrigerators with freezers, two microwaves, dishwasher, washer, dryer, propane smoker, garbage disposal. Alarm clocks, TV, DVD player, radio/CD/Tape player, canoe, small john boat, DVD movies, games and puzzles. There are 4 Kayaks available with seat, paddles and kayak life vests. Activities: Swim, boat, hike, sun and fun, fish from dock or hire a fishing charter. Boat rentals also available. Area: Several restaurants available by boat or water taxi. Teresa has been coming to Little Gasparilla Island since she was 14 years old. Her parents bought their house, which is right next to Gasparilla Villa in 1968. Little Gasparilla Island is a part of Florida most folks do not to experience. If you like shopping malls and restaurants and lots of tourist activities, this is not the place for you. If you like to fish, enjoy swimming, shelling and sun bathing with little to no folks on the beach, then this is the place for you. We look forward to hosting you and your family. Each bathroom has a sink and cabinet for storage. 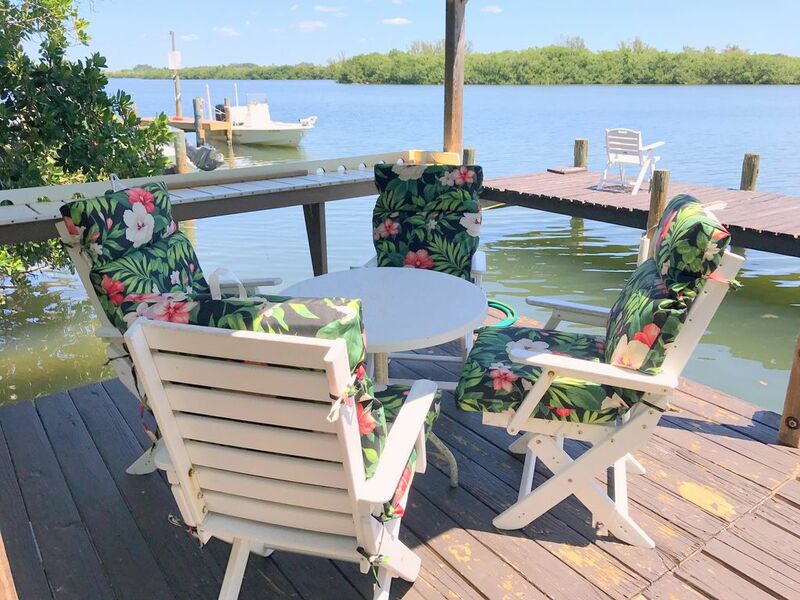 You will enjoy fishing, sunbathing, swimming, kayaking, canoeing from your very own private dock right on Lemon Bay. There are usually some spices available, there are coffee filters. If there is a special spice that you need, bring it. There is a bar between the dining area and kitchen that seats two. Sony Home Audio System, had CD player, is MP3 and Bluetooth capability through your android or iPhone. Assorted leisure books for reading. There are also fishing and shelling reference books. Lot of board games, playing cards and poker chips. Maybe out of style, but there are numerous VHS tapes to peruse. 4 adult kayaks, 2 children kayaks, 1 canoe, 2 paddleboards. Life vests provided. Pet friendly, smoking permitted outside only. My husband & I just returned from spending 5 fantastic weeks at this well-stocked, private home on a laid-back, relaxed, friendly island. This home's location on the bay offered ample opportunity to use the 2 stand-up paddle boards, canoe and kayaks included with this rental while only a 60-second walk down a sandy path to the most secluded yet beautiful beach covered in seashells, shark teeth & sand dollars. The house is well stocked with towels, dishes, games, spices & oils in the kitchen, boogie boards & inflatables, bait buckets, etc. It was spotlessly clean when we arrived. We were met at the dock by Jennifer who saw to our every need with good humor and care; she is so friendly & helpful. We knew within a very short time that we had stumbled upon a gem with this rental. Morning exercise walking & jogging the beach, paddle boarding around the bay in the afternoon & sunset walks on the nearly-deserted beach in the evening; so relaxing. All soaps and paper products are provided. Manatees & dolphins abound. You have to park your car at Eldred's Marina ($6/day & they only take cash) and take Pirates Water Taxi ($10/person/each way) to & from the island. You must call ahead of time to make a reservation for Pirates as they keep quite busy & can only take 6 people at a time. Captain Emmitt is so friendly; loads & unloads your gear & always on time. So we had to plan out at least a week's menu & grocery list at a time; Publix is 2 blocks from Eldred's. But there is a gas grill and meals on the private screened porch overlooking the bay are a treat. Twin Lobsters fish market down the street from Publix sells very fresh fish at a reasonable price. Owners Jib & Teresa were responsive & obviously aiming to do everything to ensure guests love their property as much as they do. We felt well taken care of by them and Jennifer and have already made a reservation for our return next year. If you can do without restaurants & stores (although there is one small gift shop next door with lovely items) & value tranquility, natural beauty, water sports & relaxation, one can not do better than Gasparilla Villa. So glad we found it! We are thrilled that you enjoyed your visit, truly a part of Florida most folks do not get to experience. We had our family with 2 boys and my in laws for a week, we all had a wonderful time. The kids loved being able to run to the beach and we all enjoyed endless water! Highly recommend boat or water access to truly enjoy the beauty of the area. We are thrilled that you had a relaxing time at our tropical paradise. Please consider us again in your future vacation plans. This rental was great, and probably the best choice on the island but we were just really disappointed with the island itself. If you come with your own boat then it would probably be great, but we didn't have a boat and ran out of things to do. The house came with everything you could think of and we really enjoyed the kayaks, but after a couple of days we felt like we had already seen and experienced all that the island had to offer. We fished on the dock and spent some time on the beach and even rented a golf cart but we didnt realize we would be limited on how far we could go with the golf cart. You apparently can't access the entire island with the golf carts or at least we could never figure out a way. Some of the roads were marked as private so we were not able to go down them. I thought we would be able to reach the park that is on one end but we couldnt and we also could not find the way to the other end of the island. If you are just looking to fish on the dock and hang out at the house for a quiet vacation then this is the perfect place. I guess we were just looking for more action. The locals that live on the island were also not very friendly and seem to not appreciate tourist on their island. When ever we passed anyone on the golf cart, we tried to be friendly but were just treated as outcast. We really enjoyed our stay. The house is very well stocked - the kitchen has everything you would ever need, there are more than enough linens and towels, and there are all sorts of things to keep you entertained from board games to kayaks and paddleboards. We enjoyed having coffee every morning on the screened porch overlooking the intercoastal and it's a short walk to the beach. Having the kayaks was definitely a plus, as we had fun exploring and fishing around the smaller mangrove islands. Gasparilla Villa is located 100 miles south of Tampa, 50 miles south of Sarasota and 50 miles northwest of Ft. Myers in Florida on the west coast. It is approx 15 miles north of the famous Boca Grande pass, home of some of the best Tarpon fishing in the World. Little Gasparilla Island is a bridgeless barrier island on the Gulf of Mexico along Florida's west coast. Rates are subject to change until reservation is confirmed. Your account must be paid in full 30 days prior to your arrival. If your reservation is made with less than 30 days before your arrival date, then the total amount is due. You can always call at the last minute, as one never knows if there is a sudden vacancy or not.